AUTHOR’S NOTE: This is Part I of a 2-part series on the complicated issue of open carry of firearms. In Part I the laws and actions of lawful gun owners in general will open the discussion into a hotly debated arena of gun ownership today. Part II will look at the legal responsibilities of law enforcement, and provide suggestions to law enforcement’s response to lawful citizens who open carry. It is not news that today’s law enforcement officer has an increasingly difficult job. Packed with all manner of new digital and computerized equipment, changing laws that sometimes contradict decades of precedent, and the ever-present video from in-car cameras, lapel cameras, or citizens, today’s officer is put in the spotlight every time they hit the road. One of those challenges centers around citizens‘ right to carry firearms. A constant thought and concern of law enforcement officers is a confrontation with an armed person. However, the 2nd Amendment to the U.S. Constitution specifically guarantees the citizen’s personal ownership, possession, and carrying of firearms in most circumstances. So the job becomes an even more difficult challenge as an officer must consider individual rights while at the same time discerning if a legitimate threat may exist. Since the early 1980’s there has been a very strong push in America for the States to adopt Concealed Firearms Carry laws for law abiding citizens. To a large extent those efforts have succeeded, as every State now has a law that allows concealed carry of firearms to one level or another. In fact, 42 States have “shall issue” laws, while only 8 States have “may issue” laws. It is estimated that there are over 8 million concealed carry permit holders today, and the numbers are growing exponentially. Is this a lawful citizen or dangerous perpetrator? However, another set of carry laws have been statutorily approved for much longer – the right to open carry firearms. In today’s society it seems almost absurd to think about citizens walking around with firearms strapped to their waists, but those very acts have been legal in most States for decades, sometimes even since the founding of the State. There are 44 States that allow open carry of firearms. Only 13 of those States require a permit to do so, meaning that 31 States allow open carry of firearms with little or no restrictions. Of the 6 States that prohibit the open carry of firearms there are 2 very surprising revelations. Texas, a very firearm friendly State, does not allow the open carry of modern firearms. Though there is currently a very hard push to change the law in Texas to allow for Open Carry. California, perhaps one of the most restrictive firearms States, does allow for open carry of firearms in “rural” areas. One thing is sure, the people’s push to exercise their 2nd Amendment rights is at an all time high, and the responses of the various State Legislatures has in large part responded with laws supporting that fundamental right. Laws on carrying a firearm vary from State to State. It is the response of those fighting for Open Carry where prohibited, and those who are cavalier in their Open Carry that causes me concern. First, for the law abiding citizens that want to avoid restrictive backlash from over-zealot politicians and special interest groups. Perhaps more importantly, because I am an active police officer I understand the sometimes immeasurable headache caused by the careless and flagrant in-your-face exercise of this particular right. Officers must protect the individual right, while at the same time balance the legitimate concerns of other citizens about the intentions of the open carrier. More on that juggling act in Part II. The debate on the viability of both Concealed and Open Carry will likely continue for years to come. There are obviously strong proponents on both sides of the argument. For my part I have been a strong supporter of both Concealed and Open Carry laws, however I also believe that with more freedom comes more responsibility. This belief could not be more important than when loaded firearms are involved. Open Carry requires constant attention to the exposed firearm. Since I really want to discuss the dilemma concerning the open carry of firearms I’m going to lay aside the concealed carry debate for now. The reason I want to spend so much time on open carry is the development of what I see to be a dangerous trend by some advocates of open carry laws. As I’ve said, I support both open and concealed carry laws for law abiding citizens. Open carry laws provide a much clearer legal picture for the law abiding citizen who wants to carry or move firearms around without fear of legal trouble. The choice to carry a firearm openly requires much more consideration. This type of carry is more permanent than the situations I described above. This is the citizen who straps their carry handgun onto their belt and openly walks around in public. Although I support the laws and the ability for a citizen to do so legally, I take a step back on recommending this type of 2nd Amendment exercise on a routine basis. An ardent 2nd Amendment supporter should exercise their rights in a respectful and careful manner. We recognize that firearms can be very dangerous if mishandled, and we realize that by carrying a firearm we make any confrontation we may encounter and armed encounter. And we also do this because by carrying a firearm we can become a target of the predators who seek to illegally obtain a firearm. Carrying a firearm does not provide a magical cape of super powers. On the contrary, it provides an incredible amount of responsibility. 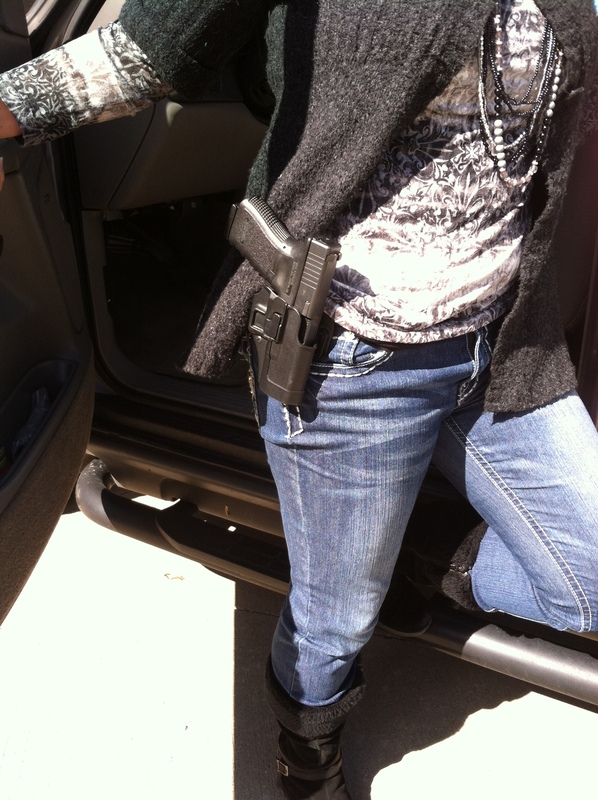 Women are the fastest growing group of new firearm buyers and carry permit holders. Another reason the 2nd Amendment supporter exercises their right in a respectful manner is because we recognize there are many who have no experience with firearms and are frightened by even the thought of an armed person. I do not lend credence to the misguided fears of these people, I simply acknowledge that they do exist. To me this act of careful respect is like the smoker who steps outside so the non-smokers are not disturbed by the smoke, and this is like the local laws that allow drinking alcohol in establishments but prohibit the public consumption of alcohol. For the person who values freedom, and values the laws that allow us to exercise our freedoms, the wise exercise of those rights should be paramount. Being respectful of others’ beliefs does not mean we have to abandon our rights. Wisdom often presents itself in the level of discernment the person exhibiting wisdom can master. 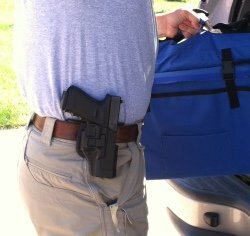 If you’re walking into the suburban grocery store, entering the movie theater, hanging out at the park … wouldn’t it be more wise to switch over to concealed carry? Many businesses are allowed by law to prohibit persons from carrying firearms on their private property. Pushing the envelope in those situations is not only foolish, but could easily bring legal troubles for the otherwise lawful citizen. Why do we need to stick our rights in the face of those who do not know your intentions or motivations? In addition, advertising firearm possession in times when we are likely to be distracted may not be the wisest choice. I live in a State that allows both Open and Concealed Carry, and has allowed open carry for decades longer than concealed carry. Occasionally someone wants to exercise their right and inevitably it becomes a big show when the call comes out of an “armed” party walking around Wal-Mart or some other populous place. Typically these are individuals carrying their pistols on their belts. Ultimately it becomes an uncomfortable situation for all involved. The open carry person feels put out that they have to defend their right to open carry. The business management feels put out that they have to be the ones to determine if the person will have to leave or if they will honor their right to open carry. And law enforcement officers are caught right in the middle of this frustrating situation with an almost impossible mission. I’ll cover the LEO’s response in more detail in a following post. 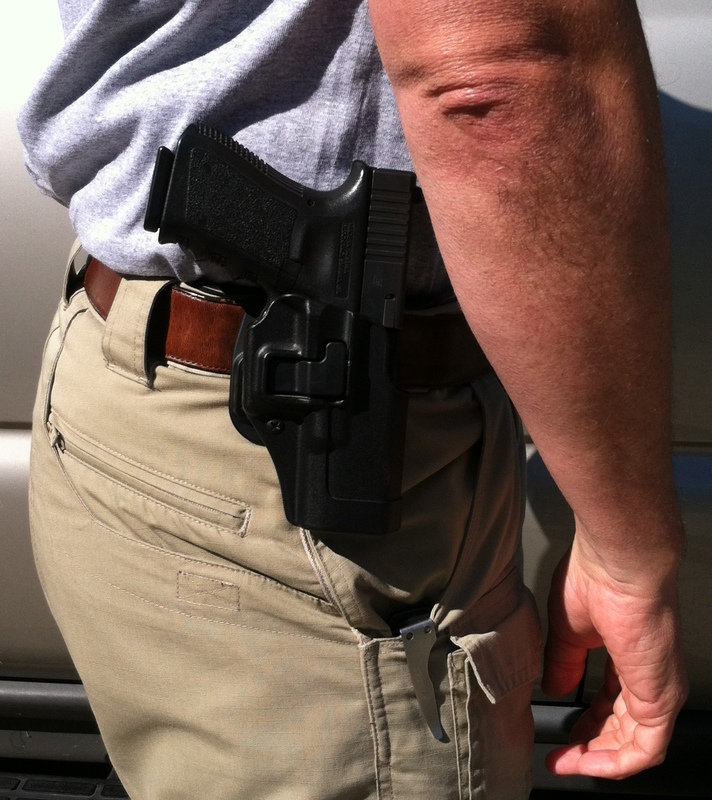 Though the person carrying a pistol on their hip can be problematic and create uncomfortable situations, those situations are actually the more benign of the open carry calls, and are usually resolved quickly. Again, I support the law to allow open carry, I simply call on those who exercise that right to do so with prudence. The folly of the open carry crowd comes when the carrier blatantly flaunts their rights in a way that is bound to cause alarm or concern. I’m not justifying the irrational fears of the anti-gun crowd, but I am recognizing that personal discipline can go a long way in garnering support for a good cause. Recently, there have been pro-open carry groups who have gone to the extent of openly carrying rifles, including AR-15’s, SKS rifles, or AK-47’s. This is particularly true in Texas where advocates are seeking to change Texas law to allow Open Carry. I support a lawful citizens right to own those firearms, and again, I support open carry laws that make it simple to understand that these citizens can openly carry their firearms. However, I draw the line at commonly carrying those firearms in the open. Great firearm, in the right circumstances. 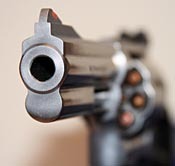 Handguns are typically seen as a defensive weapon. 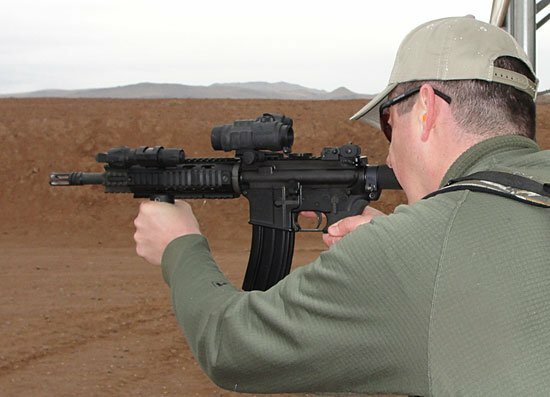 If a person should happen to see a handgun it may still be eye-opening, but Rifles and shotguns are not viewed that way and draw much more scrutiny. In my opinion, a responsible gun owner should recognize that difference and avoid unnecessary and cavalier actions. At some point self-discipline should help form our decisions, and those who choose to brazenly carry AR-15’s, AK-47’s, and rifles down the street are actually hurting the cause in my opinion. It would be like a pot smoker in a legalized State blowing their pot smoke in the face of a young mother and her children. Legal? Yes. Prudent? Of course not! What do you think of Open Carry? Stay tuned for Part II where I will discuss suggestions for the legal and proper response of law enforcement officers to these situations.